Who said you can’t teach an old dog new tricks? Most people adopt puppies, but older dogs need forever homes, too. 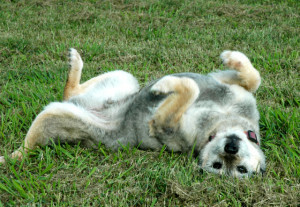 As long as you adopt a healthy older dog, you can have many years of enjoyment and companionship. Adopting a senior dog might just be saving his life. A senior dog should be integrated slowly into your family routine. He will probably adapt quite readily, but you do not want to overwhelm him. Just because he was not adopted sooner at the shelter doesn’t mean that he will be a “problem dog”. He may be a bit set in his ways, but he’s probably fully housebroken at this stage in his life. Petfinder.com is a great place to see what older dogs your local shelters may have that are adoptable. Perhaps a senior dog had a caregiver pass away, and is looking for a new best friend. Or his people may have had to move from a house to an apartment for financial reasons, and the complex doesn’t allow pets. Senior dogs usually understand most of the basic commands, so they will take less training time than puppies. He probably already knows sit, stay, come and down. This will help you to save time, especially if you have a busy work schedule. Older dogs have a longer attention span than puppies and younger dogs. Their temperament and demeanor are already established, so you know what you are getting before you commit. They don’t have the boundless energy of puppies, which can wear you out. Older dogs also are less destructive in your home while you’re at work. A senior dog is an instant companion. He already knows how to walk on a leash, and he probably has played fetch many times. Adult dogs make great partners for easy workouts, and they are loyal companions, as well. Wife, mom and owner of a pet lodge specializing in boarding for dogs and cats, grooming, day camp and breeding Border Collies & Anatolian Shepherds. We're located just outside Richmond Virginia.